Children’s Day (Kodomo no Hi) is the final holiday of the so-called Golden Week in Japan. It has been celebrated as a national holiday since 1948, but the roots of the celebration can be traced back to the 6th century. The holiday was originally called Tango no Sekku or Ayame no hi. It was one of the five Gosekku, annual ceremonies that were traditionally held at the Japanese imperial court. Adopted from Chinese practices, Tango no Sekku was celebrated on the 5th day of the 5th month in the lunar calendar. Similar holidays are still celebrated on this day in parts of Asia: Dragon Boat Festival in China, Dano (Surit-nal) in Korea, and Tết Đoan Ngọ in Vietnam. During the Meiji Restoration, Japan adopted the Gregorian calendar, and the date of the holiday was moved to May 5. Basically, it was still celebrated on the 5th day of the 5th month; it was the calendar that changed. Until recently, Tango no Sekku was known as Boys’ Day. It was an exclusively male celebration recognizing boys and fathers. Girls had their own holiday named Hinamatsuri that was celebrated on March 3. In 1948, the government changed the holiday’s name to Kodomo no Hi and declared it as a national holiday to celebrate all children, boys and girls alike, and their happiness as well as to express gratitude toward parents and celebrate family unity. However, some people argue that Himanatsuri should have been made a national holiday too instead of dedicating Tango no Sekku to all children. 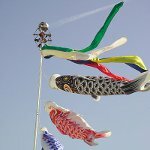 Children’s Day is also referred to as Feast of Banners because of a tradition that involves hoisting the carp-shaped koinobori windsocks. A typical koinobori consists of a pole topped with a pair of arrow-spoked wheels and a ball-shaped spinning vane, and several carp-shaped windsocks. In Japanese, carp (koi) is a symbol of strength, determination, courage and the ability to reach goals because of the old legend that a carp that swims upstream turns into a dragon and flies straight to heaven. Since all these traits are desired in children, Japanese families flow koinobori on May 4, one for each child (or for each son in more conservative families). Traditionally, a koinobori set would include a black steamer representing the father of the family, a smaller, read steamer representing the eldest son, and additional blue, green and purple or orange steamers for younger sons. Today, a black carp represents the father, a red or pink carp represents the mother, and smaller carps of different colors represent the family’s sons and daughters. Traditional dishes associated with the holiday are Kashiwa mochi (rice cakes filled with red bean paste and wrapped in Kashiwa oak leaves) and chimaki (sweet dumplings made from rice flour and wrapped in bamboo or iris leaves). Kodomo no Hi is the concluding celebration of Golden Week, a week that lasts from April 29 to May 5 and contains four public holidays: Shōwa Day, Constitution Memorial Day, Greenery Day, and Children's Day. It is the longest vacation period of the year for most Japanese employees, during which they are granted additional time off by their employers or take paid time off between April 30 and May 2.